Thanks Gale! It was a nice change to work in a community space with a group of artists- much like our experience in Artists@Work. Very cool Elaine. This really put things into perspective and it was good to see the other artists’ work as well. Very good work Elaine. 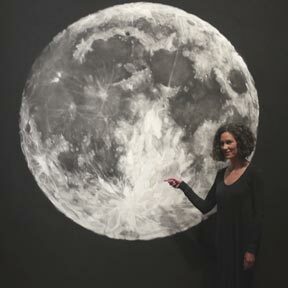 I like your way of working with the moon as image and phobia. 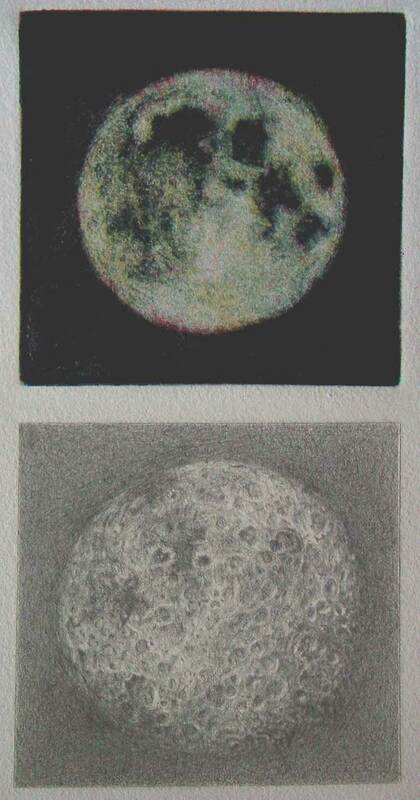 I have made drawings at the eyepiece of my telescope of the planets, a comet and some gallexies but I have not as of yet made any drawings of the moon which I can see in great detail. As of yet I don’t know how I would approach it. You got me thinking about how I need to figure out how I might approach the night sky as subject matter. So far my little drawings the eyepiece are fairly factual. Talk about factual, are you familiar with Vija Celmins drawings and prints of star fields and the moon’s surface? Apparently they’re based on Hubble telescope images (as was mine). That sounds interesting to me–combining your wonderful etching process with your astronomy interests…mmmm delicious!